Saturday — Southern Division Finals at Basic, 8:30 a.m. The meet begins with a middle school race, with the first high school competitors hitting the 3.1-mile course at 9 a.m. There will be four varsity races (two boys and two girls), with each league scored as its own race. Friday — Green Valley at Liberty, 7 p.m. This game looked a little more interesting before Liberty had to forfeit its game against Chaparral and Green Valley was upset by Coronado. Still, both teams enter with one loss, so a home playoff game could be on the line. Friday — Foothill at Coronado, 7 p.m.
Coronado’s upset over Green Valley gives this game a little more intrigue. The Cougars and Falcons are the only Southeast League teams without a loss. Foothill, the area’s only unbeaten Class 4A team, must guard against a letdown after its win over rival Basic. Friday — Sierra Vista at Bishop Gorman, 7 p.m. The Mountain Lions have won three straight after a 1-3 start, and are unbeaten in the Southwest League. Gorman has had little trouble against its two Nevada opponents, outscoring them by a combined 90-14. Friday — Centennial at Palo Verde, 7 p.m. The Panthers will look to move to 4-0 in the Northwest League if they can win at home. 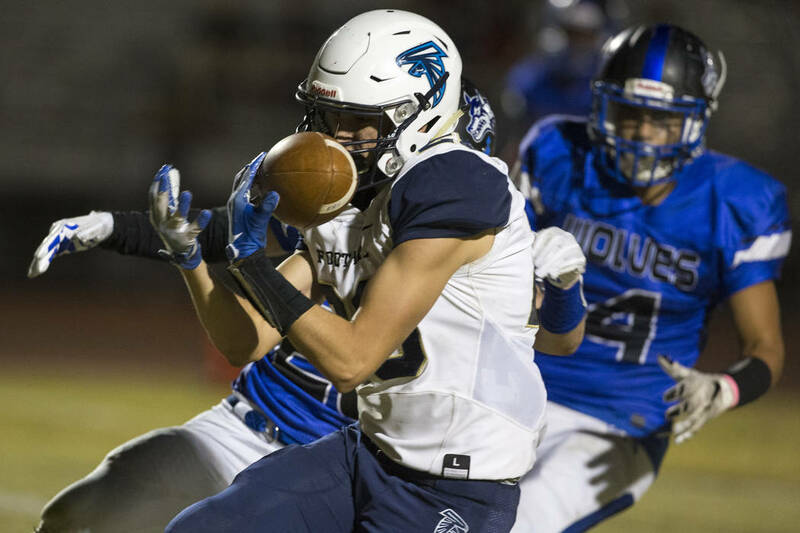 Centennial is battling with Shadow Ridge for the fourth playoff spot, so a victory would help the Bulldogs’ hopes of making the postseason. The Desert Region tees off at 11:30 a.m. on Tuesday, and everyone will be looking to knock off heavy favorite Coronado. The Mountain Region is next, and Centennial edged Palo Verde by one stroke in last year’s Sunset Region tournament. Monday — Cimarron-Memorial at Palo Verde, 3:30 p.m. Longtime Northwest League foes meet in a key contest in the new Mountain League. Neither has collected a league loss, so the winner of this game could eventually claim the Mountain League title. Tuesday — Durango at Coronado, 3 p.m. The Trailblazers have been on a tear since losing two league games in a row, and are still fighting for a first-round home game. They’ll have a tall task against the defending state champion Cougars, who are undefeated in Desert League play. Wednesday — Palo Verde at Bonanza, 3:30 p.m. If Cimarron-Memorial doesn’t beat the Panthers on Monday, the Bengals will be another major obstacle in front of Palo Verde. Bonanza has yet to lose a league game. Wednesday — Faith Lutheran at Arbor View, 3:30 p.m.
How the tables have turned. In years past, the Aggies have been the juggernaut that seemed destined to go undefeated. Now Faith Lutheran is the one undefeated in the Mountain League. Wednesday — Virgin Valley at Moapa Valley, 4:30 p.m.
It’s always a battle when these two rivals get together. Though they both trail Sunrise Mountain in the Sunrise League standings, this could be a key game in the postseason race. Thursday — Coronado at Green Valley, 4:30 p.m.
A rematch of last year’s Sunrise Region title game, the Gators will be looking for the upset just like they got last year. The Cougars still are undefeated and have one draw. The individual region tournaments will be played through Friday, with champions crowned in singles and doubles for the Class 4A Desert Region and Mountain Region and the Class 3A Southern Region. The championship matches in the Class 4A tournaments will be Friday at Bishop Gorman with the Desert Region playing at 1 p.m. and the Mountain Region at 3:30 p.m. The Class 3A tournaments will have their championship matches at 3:30 p.m. on Friday at Boulder City. Wednesday — Mojave at Pahrump Valley, 6 p.m. The top two teams in the Class 3A league square off with first place on the line. The Trojans are 7-0 in the league, while Mojave has lost one league match. Thursday — Palo Verde at Faith Lutheran, 6 p.m. The last two undefeated teams in the Mountain League square off with first place on the line.